VERSAILLES, France ― French industry has unveiled a prototype of the Jaguar, a combat and reconnaissance armored vehicle in khaki green, bristling with sensors, equipped with a self-protection kit, and armed with a 40mm cannon and new MMP anti-tank missiles. Nexter, Thales and Renault Trucks Defense on May 16 presented the six-wheel drive vehicle to journalists ahead of the Eurosatory trade show, which runs June 11-15. That industry team is putting two prototype vehicles through tests to prepare for a certification, with a further two without turrets, dubbed ”mobility benches.“ Developing and building the Jaguar is a key part of the French Army’s €10 billion (U.S. $12 billion) Scorpion modernization program. Track our full coverage of Eurosatory here! An executive at the press briefing forcefully rejected previous media reports of the limited space on French railway carriages forcing there to be an MBDA MMP missile launcher on just one side of the Jaguar turret, while an export version will have launchers on both sides. “I am very angry,“ he said. There had been a French Army preference for the launcher to be on only one side. The draft multiyear military budget law for 2019-2025 has increased orders and sped up delivery of the new armored vehicles in the Scorpion program. The order for the Jaguar has been boosted by 48 units to a total fleet of 300, said Erwan, director of the Scorpion program at the Direction Générale de l’Armement procurement office. Erwan’s last name has not been provided for security reasons. The first Jaguar is to be delivered to a French cavalry regiment in 2020. The French Army unveiled for public display on July 14 the Griffon multirole troop carrier, one of the vehicles driven in the Bastille Day parade for which U.S. President Donald Trump is a guest. Contracts for the increased orders are expected to be signed later this year, after the French Parliament formally adopts the draft military budget law, expected in July. The boost in orders follows the Army’s call for a speedy introduction of the new combat vehicles, which will replace the AMX-10RC, ERC-90 Sagaie and VAB Hot. What’s the vehicle equipped with? Protective equipment on the Jaguar include a Thales Barage ― an active jamming device that targets improvised explosive devices ― and two sets of Antares, a missile warning alert system, 360-degree coverage. 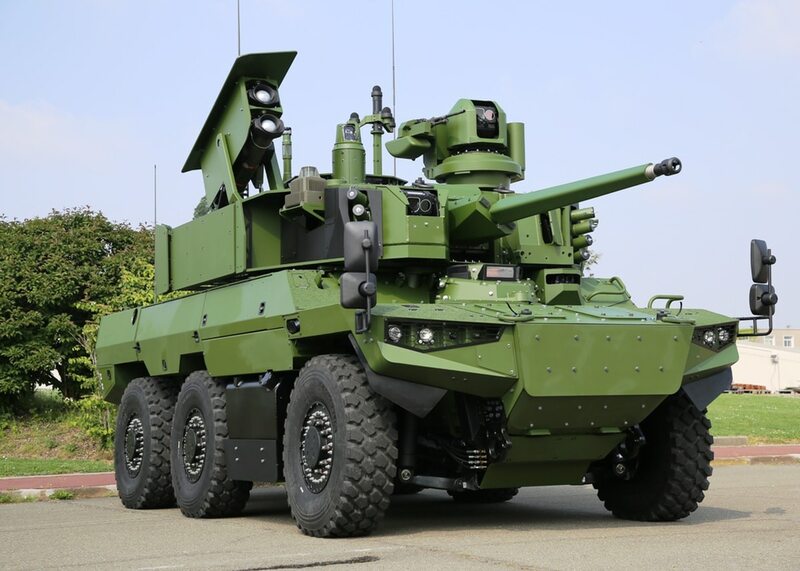 The Griffon troop carrier and Light VBMR reconnaissance vehicle will each have one set of Antares, and the equipment will also be fitted on the Leclerc tank and VBCI infantry fighting vehicle. Jaguar will also be fitted for — but not with — Diamant, an active blocking system from TDA, a Thales unit. A Metravib Pilar V acoustic sensor on the roof is intended to spot enemy gunfire. The Army asked for the driver and gunner to have simple optical sights rather than depend on video and optoelectronic systems. The Jaguar is powered by a 500-horsepower engine, allowing the vehicle to reach a maximum speed of 90 kph. The vehicle’s endurance is 800 kilometers. The 40mm gun is from CTA International, a BAE Systems and Nexter joint venture. There is also a remote controlled 7.62mm machine gun. Besides the two MMP missiles in the turret launcher, another two missiles are stored inside the vehicle. Jaguar will be plugged into the Bull SICS battle management system, or Scorpion Information Communication System, and the Thales Contact software-defined radio ― tools that underpin the so-called collaborative combat concept, which seeks to heighten teamwork on the ground and with commanders at the regimental level. RTD supplies the chassis, rather than Texelis, a specialist company which supplies that equipment on the reconnaissance vehicle Light VBMR. Jaguar is a wheeled vehicle, but its design architecture is that of a tank, an executive explained. The driver sits in the front of the hull and the power pack at the back, the executive added. The vehicle can hold a three-strong crew, with two sitting in the turret.